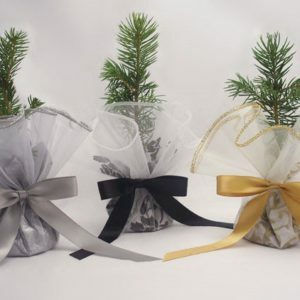 Our tree seedlings centerpieces do double duty as centerpiece during your event, then guests can each take home individually packaged trees at the end of the day as a tree favor. 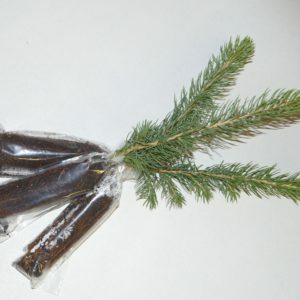 Any of our seedlings can be used in the centerpieces and are perfect as a wedding centerpiece and tree wedding favor. 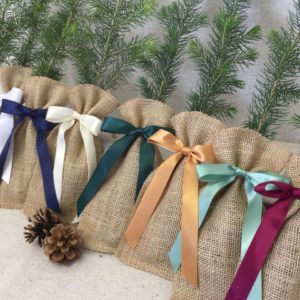 They come fully assembled with ten seedlings placed in a 6 inch biodegradable coir pot and wrapped with natural burlap, or organza and your choice of tissue paper colors. Each centerpiece is finished off with a raffia or tasseled bow. 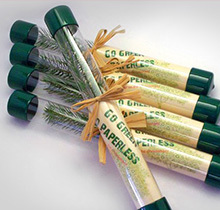 Personalize your centerpiece with a 2.5” x 4” card for your special event. Which border do you want for your tags? Fed Ex Ground will take 4 days to reach your location. For a faster option, please call the office at 1-800-825-5122. Our representative will call or email you within 2 business days to determine shipping cost to Alaska. Unfortunately, we are unable to ship live plants to Hawaii.